Desk top unit with speaker and microphone to enable tele-conferencing over analogue telephone lines. 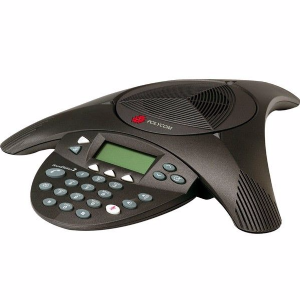 Polycom SoundStation 2 is ideal for small and mid-size conference rooms seating up to 10 participants. Users can speak in a normal voice and be heard clearly up to ten feet (3-meters) away. NOTE: Refurbished units, without warranty, are available for £50.